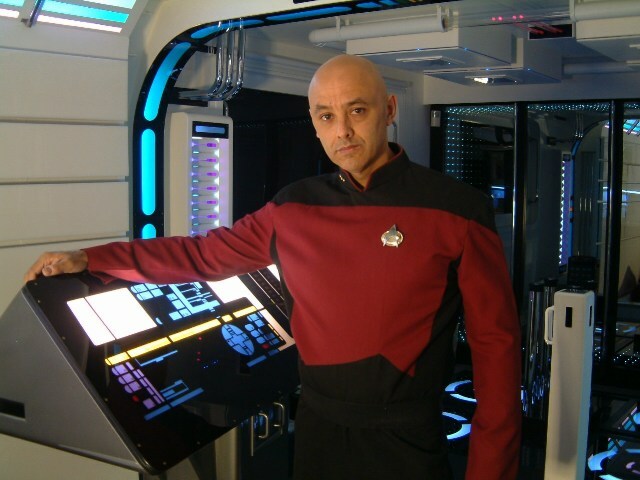 Tony Alleyne, who spent 10 years and $150,000 turning his apartment in Hinckley, Leicestershire, into an exact replica of the transporter control console from Star Trek: The Next Generation, has finally lost the world’s most painstakingly elaborate Trek homage in a divorce. The 58-year old pretty much went broke converting the flat, and, when his wife Georgina filed for divorce after a long separation, she stipulated that she wanted to sell the apartment. The good news is that it was auctioned off on eBay and sold for five times what it was listed for, finally netting £425,000 (or close to $700,000) from a Birmingham business man who is, I assume, as big a Star Trek fan as Alleyne. And who is, I assume, stinking filthy rich. Alleyne has his own interior design business, 24th Century Design, which appears to offer customers the chance to turn their homes into spaceships, too. Check out his site for more pictures of his amazing apartment, may it rest in peace. How about you guys? If you had the resources, would you turn a room of your house/apartment into a piece of Star Trek memorabilia? And which ship would it be? I’m going with the room where Archer used to show movies on Enterprise. DIBS! *Tony Alleyne is NOT the ‘saddest man alive’ (as the blog post heading indicates) because he turned his house into the Enterprise. He is awesome because of this. He is the saddest man alive because he had that and lost it. It’s not a judgment. I really think he’s sad. When I was a kid, there was a fan-made replica of the original series’ bridge that was touring around and was set-up in a local mall for a weekend. It was pretty cool. I got to sit in the Captain’s chair. To me that’s the most iconic set of all the series but I wouldn’t want it in my home. I build scale models and having the ships on display in the office is enough for me. That’s the ONE THING the Enterprise was missing. It was. But then again you could go swimming in the holodeck… by the beach… in Tahiti… whenever you wanted. Screw the pool. I’m putting in a holodeck!